tobygant.com: Just living the dream. I was on the back deck the other morning drinking a cup of coffee, when I noticed a tiny spider making a really neat looking web. With my camera and macro lens in tow I went to take a closer look. What I found was a tiny “spiky-looking” spider that is generically called an orb weaver. (It’s actual name is Micrathena Gracilis.) 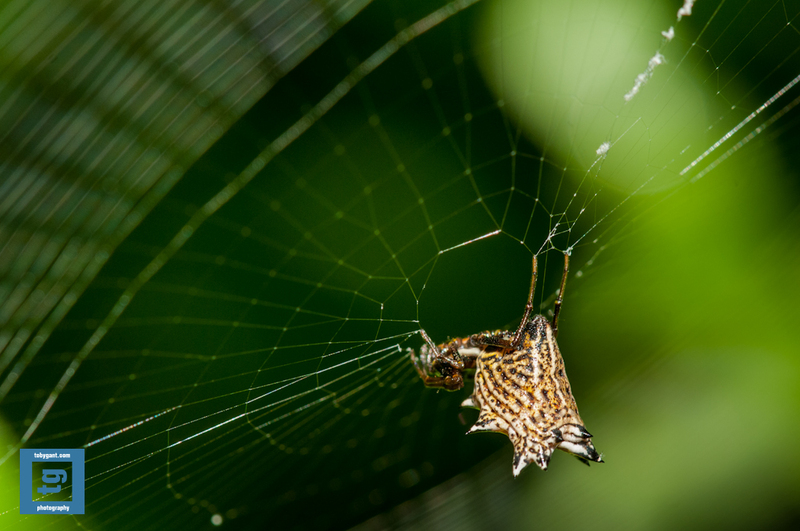 It is fun to watch this tiny creature build such a large intricate web. I captured this image using my 105mm VR micro. The camera was tripod mounted. Please share any thoughts you have. Please follow my blog or view my gallery images at my domain: www.tobygant.com. I had to share another image from Amicalola. I badly wanted to add this image to my gallery as a black and white image. It really pops when I convert it. The textures that are present throughout the image really make it work. But, I love the colors too much to convert it. The earthy tones make the image work even better. It may end up filling a frame in my home as a black and white. But as for my gallery, what you see is what you’ll get. This image was captured using my 50mm f/1.4 with a circular polarizer. You can follow my blog at its new location: www.tobygant.com. As always, thanks for stopping by. I was finally able to get outdoors today and get some fresh air. We went to Amicalola Falls State Park near Dawsonville, Georgia. We spent a couple of hours at the lower falls. It is such an incredibly beautiful park in the summertime. I’m very pleased with my captures today. I’m also a little disappointed. I was looking forward to spending a few minutes with Lightroom 4. But, I nailed the exposures and the white balance in camera. (Not much work to do at all.) With all that said, I decided to give LR/enfuse a try with Lightroom 4. As usual the results were incredible and it was a super easy process. This image is the HDR result. I captured the image using my 16-35mm f/4 with a circular polarizer. As always, thanks for stopping by. Please feel free to share your thoughts. You can also follow my blog at http://tobygant.com. I’ve been busy with everything associated with life for the past couple of weeks. Between my schedule and rainy weather I just have not been able to find the time to get outside. Today was a productive day indoors. I was able to put some time in on the new site and get a few minutes in with Lightroom. I love working in post. To me it is as much a part of the image as the actual capture. Although I usually only make minor modifications, it is important to adjust the white balance, sharpness and crop if necessary. All of those things are critical when you are trying to recreate the image that you visualized at the time of capture. I guess it is just a carry over from my days when I worked in an actual darkroom. It is just part of my process. But, back to my original thought. I really need to get outside with my camera in hand. It has been too long. Please let me know if you have any suggestions for a great spot in the Blue Ridge Mountains. Remember to follow me at my new domain: http://tobygant.com. Thanks for stopping by. Last weekend we revisited the Tennessee Aquarium in downtown Chattanooga, TN. It was great fun for the kids. They were much younger the first time we went and I believe they got much more out of it this time. I did also. The last time we visited I only had a small point and shoot camera in my arsenal. This time I had the right tool for the job. It can be extremely challenging shooting through 3 inch “bullet-proof” glass. Not only that, if it is curved glass don’t even waste your time. There were so many people at the aquarium shooting with full flash straight into glass. They would chimp from the back of their cameras and stand their puzzled. I truly wanted to help them all. But, I think my wife would not have been pleased if I’d interrupted our family time. I had a great time and got some great shots. I hope you are all out getting some captures this weekend. 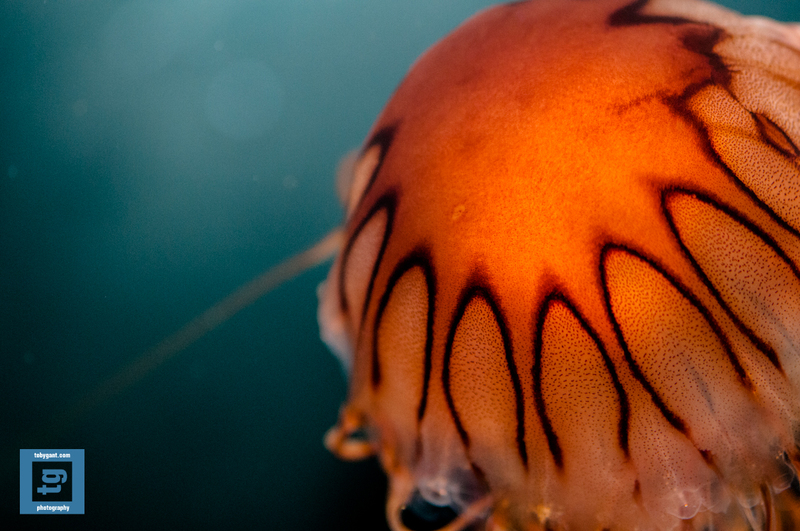 This image is of a Japanese Sea Nettle. It was captured with my 105mm VR micro. You can follow my blog at its new location http://tobygant.com. Well, it’s official. I made the leap to Adobe Lightroom 4 today. I must say that they have put an incredible amount of work into this product. There are more advancements than I have seen between any of the other versions. I have not had an incredible amount of time to work with it yet. But, what I have seen is great. I’m looking forward to working with it more. The new “Whites” slider is going to take me a minute to get accustomed to. I keep looking for the brightness slider and it is no longer there. But, I’m certain it will be second nature after a few hours at the keyboard. 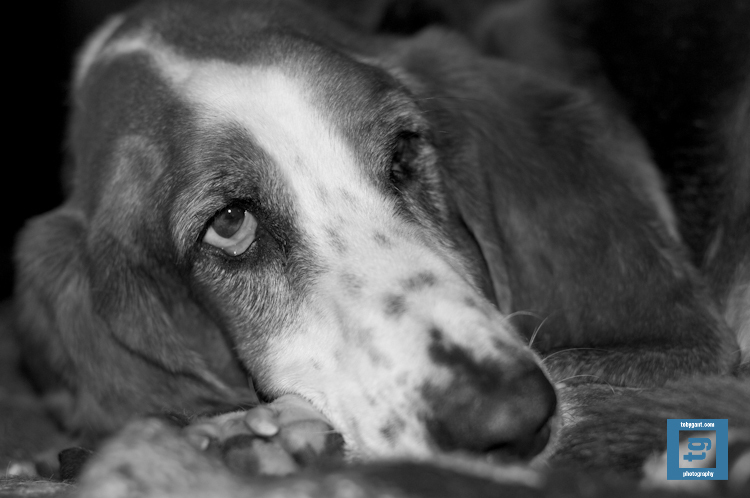 Feel free to share your thoughts on Lightroom 4 here on my site. Just a reminder you can follow my blog at its new location http://tobygant.com. Thanks for stopping by. The stars aligned perfectly yesterday morning. Well, almost perfectly. I found myself with a 3 hour window in my schedule that I could spend any way I wanted. I chose to make a 1 hour drive to Vogel State Park. It is a 10 to 15 minute hike to the falls from the parking lot leaving me 30 full minutes to go shoot before I had to head back to the city for an appointment at 10:30. The 60 minutes between hiking and shooting was well worth the 2 hour drive. I was able to get away from everything and breathe in some fresh air. I hope I will be able to find some more time this weekend. This image was captured with my new 50mm f/1.4. 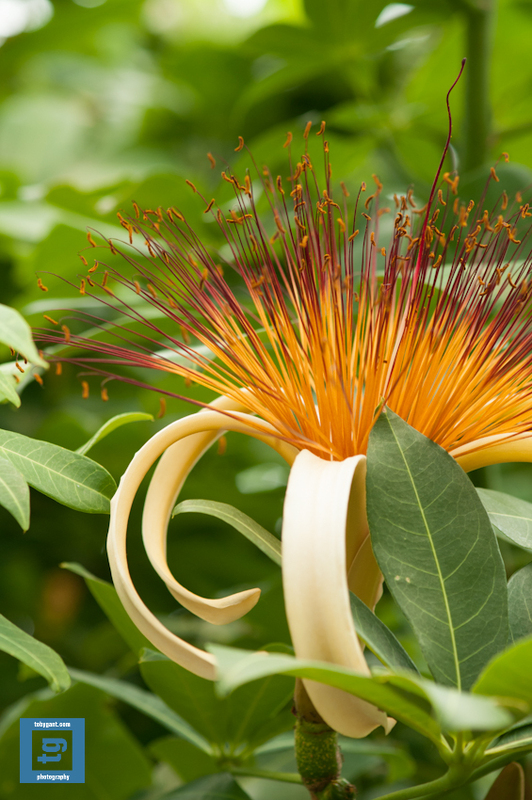 You can find a high-resolution image on my site at http://www.tobygant.com/vogel#h2549844d. Yes, you did read the title right. 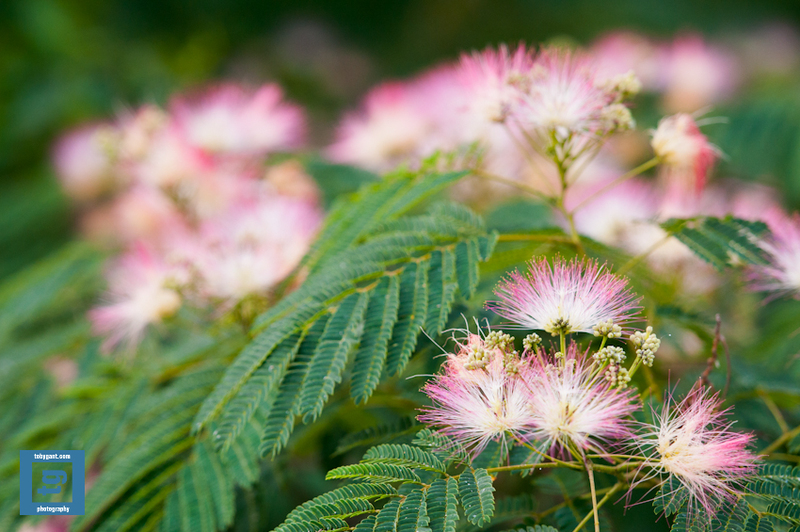 I have been trying to get a unique perspective on the mimosa blooms that happen to reside on the top side of the mimosa trees. (Don’t try this at home, kids.) So, I went to my upstairs bedroom window that is near one of the trees and climbed out of the window with my camera while sitting on the window sill. I know my wife thinks I have lost my mind. But, I was able to get some interesting captures from inside the house. Thanks for stopping by. You can find more of my images at my site http://www.tobygant.com/. 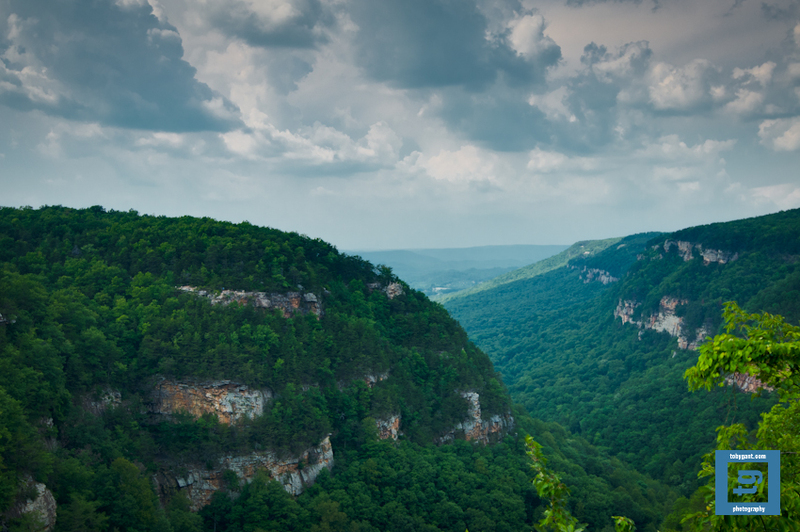 This is a HDR image I captured at Cloudland Canyon State Park. The image is compiled of 5 images captured 1 stop apart. The images were processed using the LR/Enfuse plugin for Lightroom. I’ve been using this for all of my HDR work for some time now. It’s been quite some time since I’ve used any other software for my HDR process flow and I thought I would go back to some of the more popular solutions for a change. Long story short, my experiment was a failure. I went back to LR/Enfuse and I will stay with it. There is simply nothing else out there that produces “natural” looking HDR images with as much ease as LR/Enfuse. If you haven’t given it a try, you should think of giving it a quick look. You can see a high-resolution of this image on my website at http://www.tobygant.com/cloudland. Please feel free to leave comments. And if you’ve tried LR/Enfuse, what are your thoughts about it? 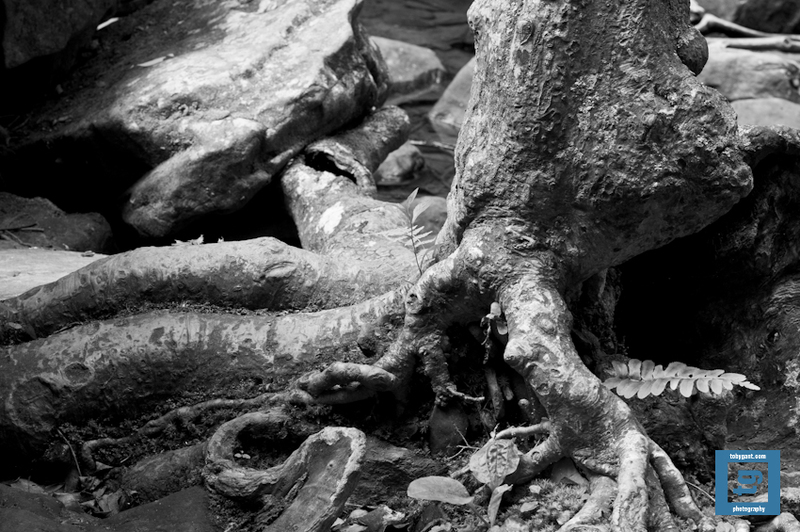 This image of a tree rooted in the rocks at the base of the falls is one of my favorites from my short adventure. When I first saw it I immediately visualized it in black & white. The textures of the tree and stones were raw and edgy. The shadows were well-defined and dark. I feel this capture perfectly demonstrates the volatile landscape that surrounds you at the park. 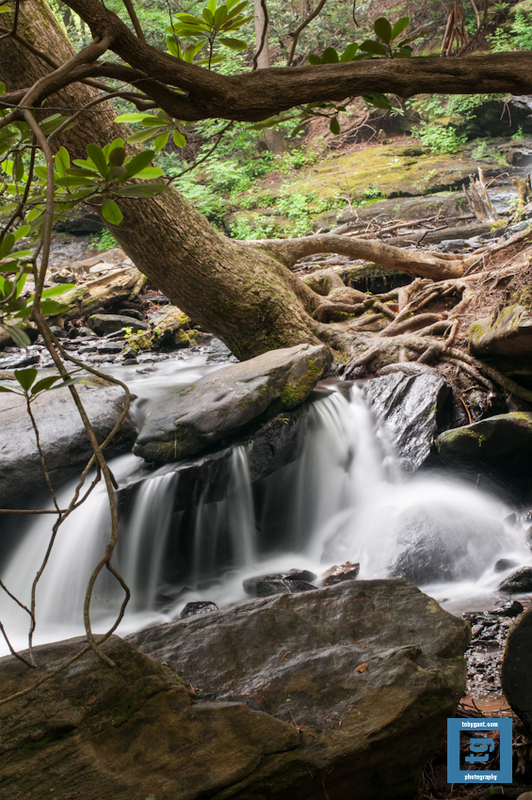 You can find a high-resolution image of this shot and many more on my site at http://www.tobygant.com/cloudland. And as always please feel free to leave your comments. 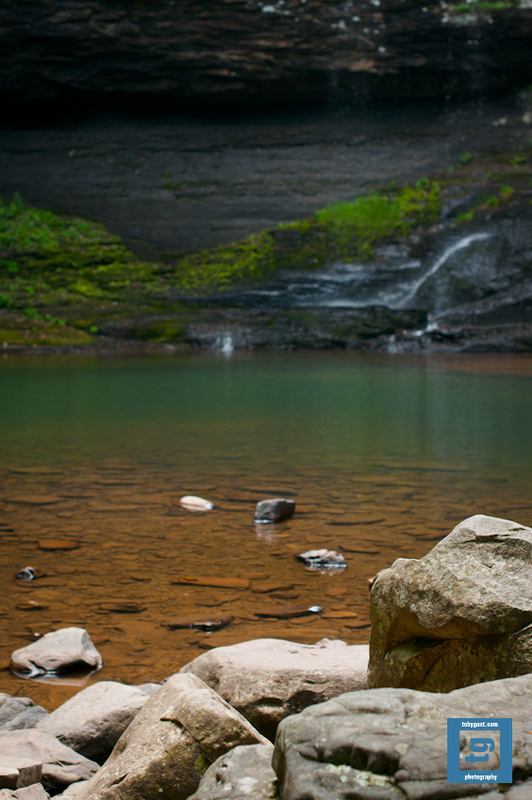 I am still sorting through my captures from my trip to Cloudland Canyon State Park on Saturday. It is such an incredibly beautiful place. It was a long walk down the mountainside into the canyon in order to reach the falls. It was also much longer working our way back up. The kids held up extremely well and I think they are growing accustomed to the long hikes which pleases me more than I can say. We are building memories that I hope will stay with them long after I am. I fell asleep Saturday evening reliving our weekend adventure. I’m fairly certain I will be doing the same all week. 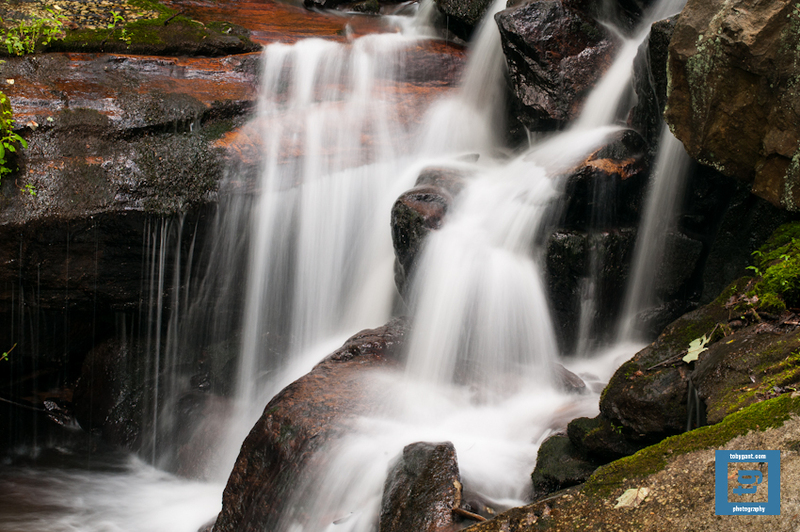 This is an image captured at the base of the upper falls. 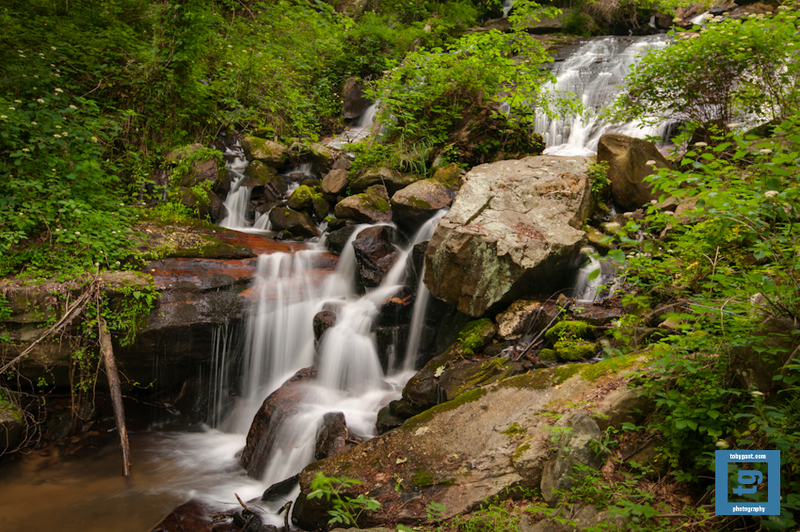 The emerald-colored water was striking against the forest and boulders. You can find images from this adventure and many more at my site http://www.tobygant.com/cloudland. As always, thanks for stopping by. 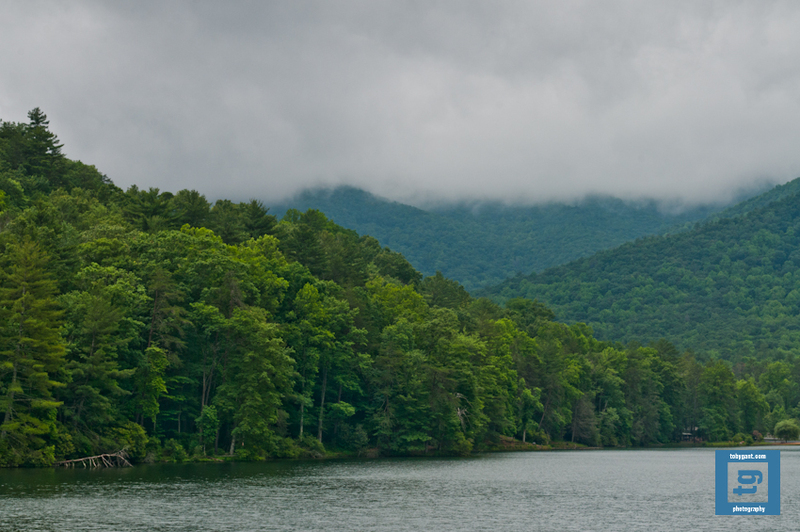 If you have any suggesting for parks to visit in the Blue Ridge or Smoky Mountains, please leave your comments on my blog. We were not able to go for an adventure last week due to poor weather. 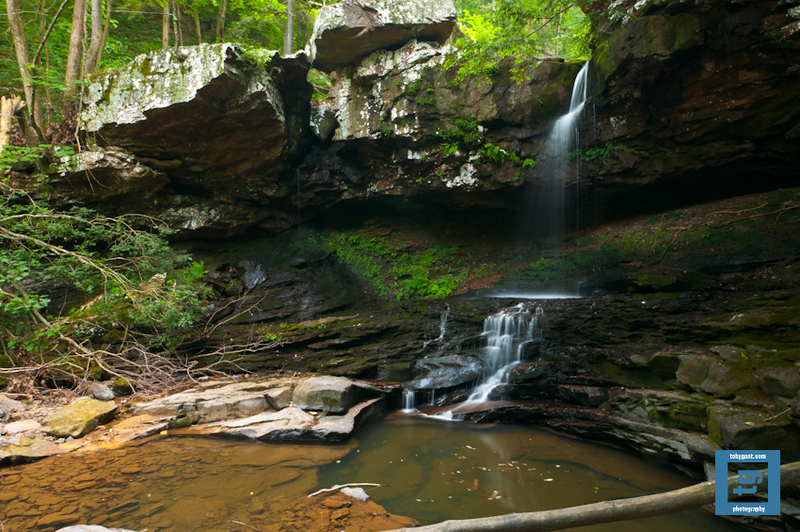 We made up for it this week in a major way when we visited Cloudland Canyon State Park near Rising Fawn, Georgia. The park came highly recommend by a friend. (Thanks, Elise.) And it definitely lived up to all the hyperbole. We only had a limited amount of time to spend at the park and we chose to visit the falls this time out. I’m very happy we did. It was truly an adventure. I felt a million miles away from everywhere. I can’t wait until we can visit again. This shot was captured with my 16-35mm f/4. I simply love shooting landscapes with this lens. As always you can see a high-resolution version on my site at http://www.tobygant.com/cloudland. Thanks for stopping by. We took the kids to visit supermoon again this year. The last time we saw it we were in Florida. Tonight we watched it rise over Lake Lanier in Georgia. Conditions were not as good as what we experienced last year. But, I was still able to get a couple of interesting shots. I hope everyone had an opportunity to get out and see it tonight. Please share links to any shots you were able to capture here on my blog. I would love to see them. 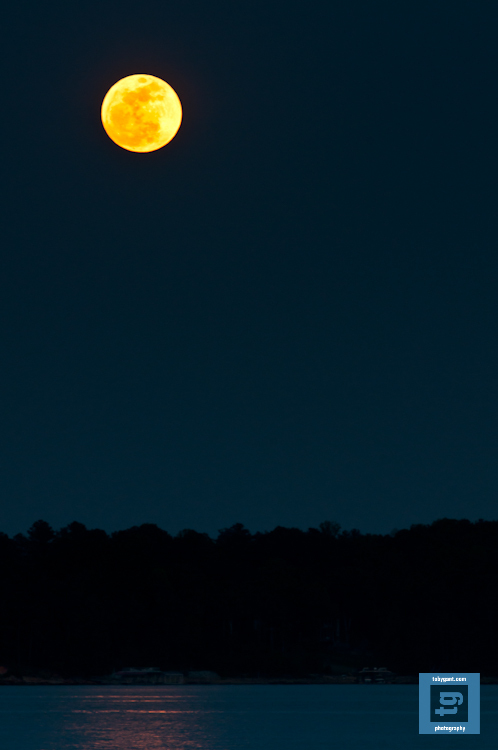 My favorite shot of supermoon from last year is on my site at http://www.tobygant.com/springpark#h25172045. Thanks for stopping by. There is a new addition to our back yard. There is a new cardinal and hen that have joined our existing couple. They have not had a very warm reception from the existing birds. 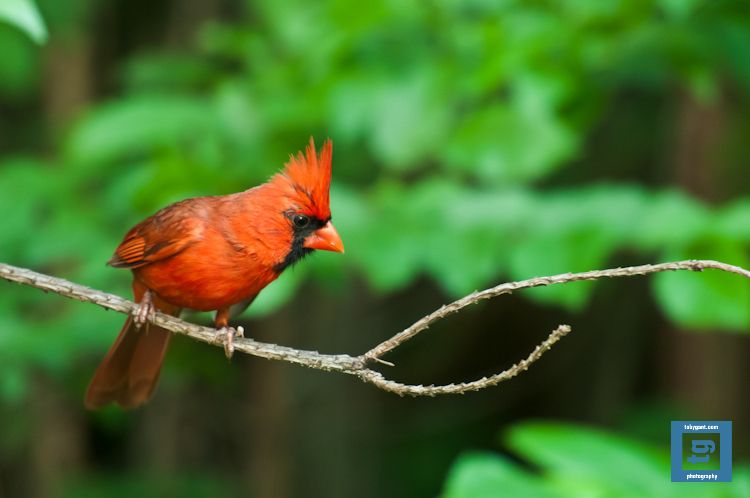 Red, my first cardinal, seems to particularly dislike him. My wife has dubbed the scrappy new bird “the interloper”. I think he’s stuck with the name. I also think Red needs to get accustomed to him being here because the interloper seems to have no intention of leaving the feeder anytime soon. I talked the family into climbing Sawnee Mountain again yesterday. This image is a panorama compiled from 10 separate images. It is an incredible view of Georgia’s Blue Ridge Mountains at sunset from that elevation. I captured the image with my new 50mm f/1.4. The detail of the full resolution image is stunning. You can actually make out signs on the streets below. As always you can see more of my images at http://www.tobygant.com. I know the age-old saying to let sleeping dogs lie. Well, I wanted to run my new 50mm f/1.4 through the paces. So, something had to give. (My apologizes to Copper for waking him from his dreams of chasing rabbits.) The lens, I am happy to report, is simply incredible. It is sharp as a tack and the bokeh is beautiful. Thanks for helping out hound dog. I was able to post some of my favorite shots to my site. There are so many great images to choose from but, I just cannot get enough of the P-51. It is not just any one thing. It is everything all together. It is a truly one-of-a-kind aircraft. The contours of the aircraft are unmistakable. Not to mention the history. What truly incredible times were taking place across the globe when it went into service. I can only imagine what it must have been like. But, watching this beauty in flight helps me imagine it. You can see this and more images from the air show at http://www.tobygant.com/robins2012. Please let me know your thoughts on my captures. 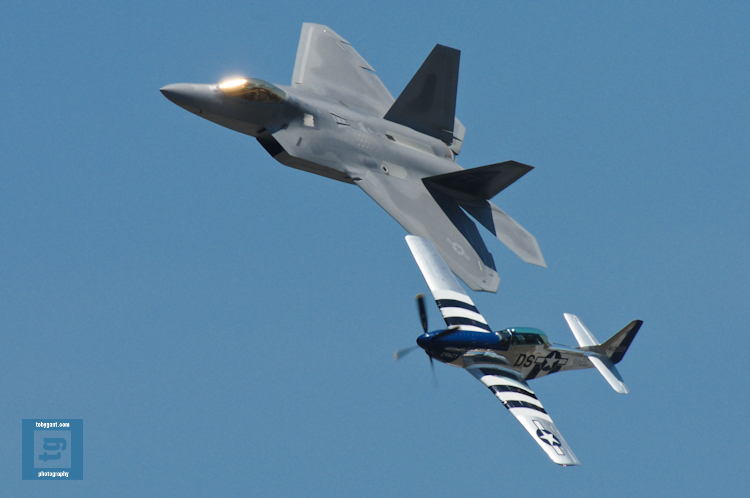 This image is of the P-51 Mustang flying in tandem with the Raptor. 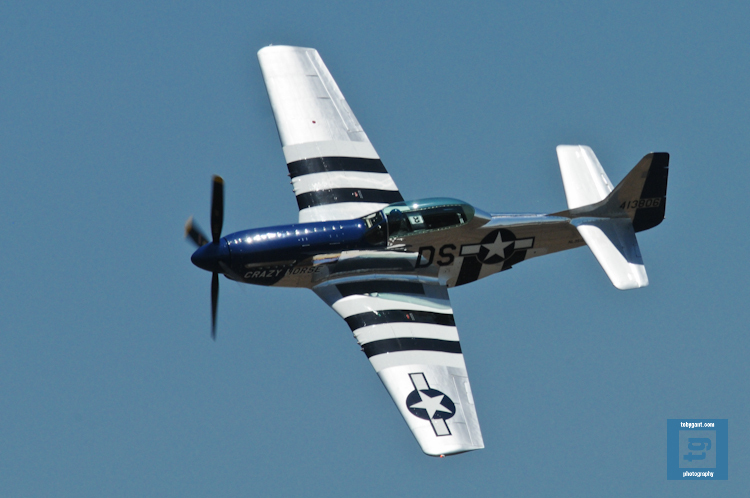 The P-51 has to be my favorite air craft of all time. It is steeped in history and it’s design is unparalleled. Seeing these two aircraft flying side by side is a thing of beauty. Please get outside today if you can. There is more to come on my site in full resolution at http://www.tobygant.com/action. I had an incredible time today at the Robins Air Force Base Air Show near Macon, GA. If I am not in nature capturing images of landscapes or animals, my next favorite thing to photograph would definitely be airplanes. And there was plenty of opportunity today at the show. It will take some time to go through all the images I was able to capture today. But, I will be posting several to my site this week. 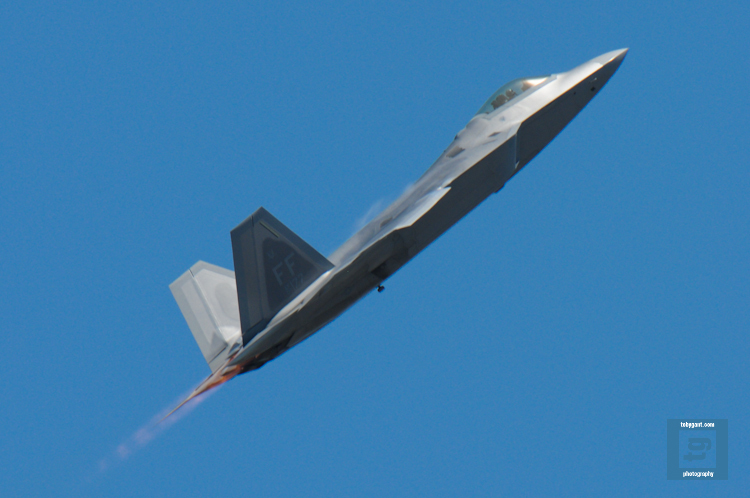 This image is of the Air Force F-22 Raptor. It is an incredible fighter jet. I hope everyone else has is able to get outside and get some fresh air and cool shots over the weekend. More to come at my site http://www.tobygant.com/action. We went to Black Rock Mountain State Park near Mountain City, Georgia over the weekend. We trekked the 2.2 mile Tennessee Rock Trail. What an incredible view! The overlooks inspired me to attempt panoramas. This particular panorama is three images shot horizontally and merged in CS5. I took another that is 9 images shot vertically and merged. CS5 makes it easy to accomplish. The detail in the 9 image shot is incredible. I will definitely be making many more attempts at panoramas. But, as far as my first attempt is concerned, I am calling it a success. I do recommend shooting vertically if you plan to attempt one. I plan to post several images from the shoot to my website this week. Please stop by and take a look at http://www.tobygant.com/blackrock. Thanks for visiting my blog.